Cricket Ireland has defended its promotion of Ireland’s upcoming T20 series against Afghanistan and the decision not to erect a temporary grandstand at host venue Bready. In a statement released to the News Letter on Tuesday following fierce online criticism, Dennis Cousins, commercial director at Cricket Ireland, insisted that the governing body has been “promoting and rolling-out support” for the series for several months. Ireland are to play three T20 internationals at Magheramason against Afghanistan, starting on Monday, August 20. Online critics claim Cricket Ireland has not adequately promoted the series but Mr Cousins said the radio campaign ahead of the three matches is the “most comprehensive we’ve ever undertaken in Northern Ireland” and insisted that Cricket Ireland’s digital channels have been promoting the series since July. In response to stinging criticism over the planned seating arrangements, Mr Cousins also revealed that while Cricket Ireland did consider options including “temporary grandstand seating to more flexible fold-up seats”, it had decided to go for fold-out seats. In an article on Cricket Europe, the author slammed Cricket Ireland’s efforts around the series and predicted crowds would not come out in force as a result. The article has attracted praise online from a number of figures involved in Ulster cricket. “Originally we were told that temporary seating for up to 600 people would be put in place and then that was changed to 200. Now apparently we’re to get a quota of folding plastic seats instead,” said the author. “It has all the makings of a slapstick comedy sketch. A couple of hundred folding plastic seats around the boundary at Bready, where if the wind gets up, half of them might end up across the Foyle in St Johnston. “Are CI’s marketing and media departments closed? I’m sure if they had asked the appropriate people in the North West they would have happily helped out. “We know the NWCU gets a lot of flak about being quick to complain but our own T20 days, both at domestic and Interprovincial level have been huge successes numerically. Dean Simpson of Lisburn Cricket Club also slammed the promotion around last Sunday’s Toyota Super 3’s women’s cricket competition at Wallace Park. 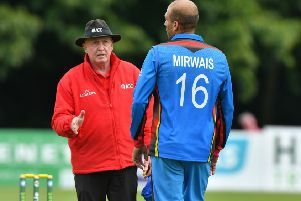 In a lengthy statement, Mr Cousins strongly denied Cricket Ireland had not promoted the Afghan series. “The radio campaign alone is the most comprehensive we’ve ever undertaken in Northern Ireland - and exceeds previous radio campaigns we undertook around the West Indies in 2017 and Australia in 2015. Through a radio partnership with Downtown and Downtown County in NW, and Cool FM in the NCU region we are rolling out advertisements, outside broadcast opportunities and ticket giveaways. “Cricket Ireland digital channels have carried promotion of the series since July, after the completion of the India T20I series, and this has included designed graphic promotions across our website and social media channels. “Prior to this Cricket Ireland utilised other events as a vehicle to promote the series, including content in the Ireland v India T20I match programme and on LED signage around the ground during those matches, which reached a global TV audience of many millions.